The Cold War turns hot in a military thriller that's so out of touch with today's reality, it feels like science fiction. 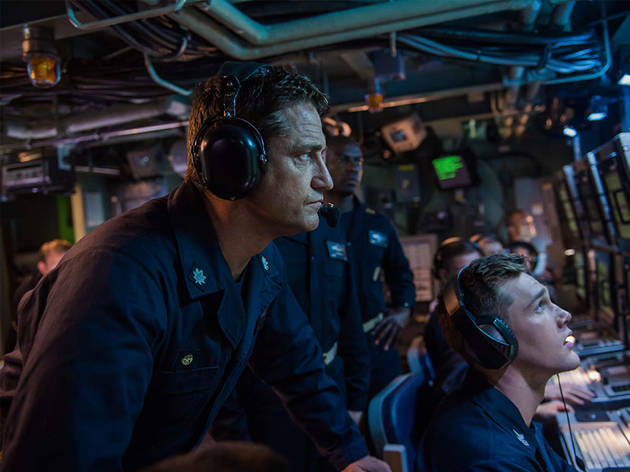 Impressively silly even for a submarine thriller (a genre that often plunges into ponderous waters), Hunter Killer exists in a fantasy world reflecting its delayed release, following a shoot that began in mid-2016. A reform-minded Russian president (Alexander Diachenko) is kidnapped by rogue elements, dudes who have never heard of fake news. A Hillary-esque U.S. leader (Caroline Goodall) soberly weighs responses in her war room, nary a Big Mac wrapper in sight. A belligerent admiral (crazy Gary Oldman, pre-Oscar) gets into shouting matches with a brilliant junior officer (Common). All of it amounts to desperate nostalgia, not only for Bruckheimer action dramas but for an alternate political landscape marked by showdowns over honor conducted by semi-intelligent people. Still, even this kind of WWIII escapism—it’s based on a 2012 novel by Don Keith and George Wallace called Firing Point—requires a sturdier hero than Gerard Butler, who finds himself in a time machine that delivers actors to rejected Tom Cruise projects. Butler plays sub captain Joe Glass, whom you wish you could call a man of few words; he talks way too much. (Perhaps Rock Hudson in Ice Station Zebra wasn’t that bad after all.) 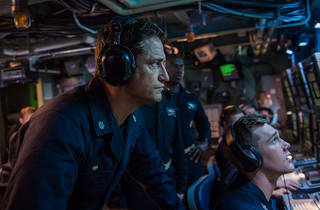 Splitting the difference between scenes of Navy SEAL rescue attempts, underwater evasive maneuvers and your own countdown clock toward an incipient nap, Hunter Killer feels both generic and underheated. You’re struck by the amount of technology on display: laser-targeted missile launches, torpedoes and the like. Much of it is rendered by computer effects, but it’s still real enough to get you worried about the world outside the multiplex, where the button-pushers make these characters look like paragons of restraint.